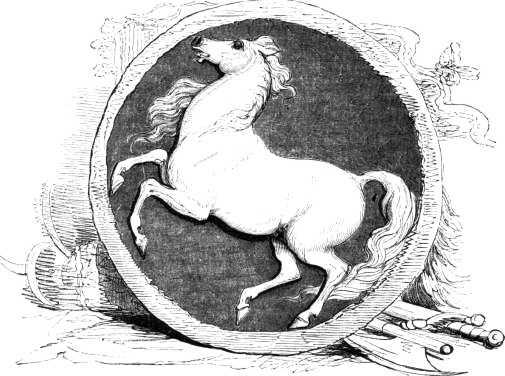 The Standard of the White Horse. Britain was henceforth the land of the Angles—Engla-land, Engle-land, Engle-lond. Little more than a century after the settlement in, or conquest of, the country by the three nations of the Jutes, the Saxons, and the Angles, the supreme monarch, or Bretwalda, thus subscribed himself:—“Ego Ethelbertus, Rex Anglorum.” The Angles and the Saxons were distinct nations, and they subdued and retained distinct portions of the land. But even the Saxon chiefs of Wessex, when they had extended their dominion into the kingdom of the Angles, called themselves kings of Engla-land. In our own times we are accustomed to use the term Anglo-Saxons, when we speak of the wars, the institutions, the literature, and the arts of the people who for five centuries were the possessors of this our England, and have left the impress of their national character, their language, their laws, and their religion upon the race that still tread the soil which they trod. Sir Charles Knight here quotes from a poem by Thomas Gray (1716 – 1771), The Alliance of Education and Government. A Fragment. To different climes seem different souls assigned? Their arms, their kings, their gods were rolled away. The blue-eyed myriads from the Baltic coast. See www.thomasgray.org for more details and the rest of the poem. The material monuments which are left of these five centuries of struggles for supremacy within, and against invasion from without, of Paganism overthrowing the institutions of Christianized Britain by the sword, and overthrown in its turn by the more lasting power of a dominant Church—of wise government, of noble patriotism, vainly contending against a new irruption of predatory sea-kings,—these monuments are few, and of doubtful origin. The Anglo-Saxons have left their most durable traces in the institutions which still mingle with the laws under which we live,—in the literature which has their written language for its best foundation,—in the useful arts which they cultivated, and which have descended to us as our inheritance. Their most enduring monuments are the Manuscripts and the Illuminations produced by the patient labour of their spiritual teachers, which we may yet open in our public libraries, and look upon with as deep an interest as upon the fragments of the more perishable labours of the architect and the sculptor. But of buildings, and even the ornamented fragments of churches and of palaces, this period has left us few remains, in comparison with its long duration, and the unquestionable existence of a high civilization during a considerable portion of these five centuries. But it is possible that these remains are not so few as we are taught to think. It has been the fashion to believe that the invading Dane swept away all these monuments of piety and of civil order; that whatever of high antiquity after the Romans here exists is of Norman origin. We have probably yielded somewhat too readily to this modern belief. For example, Bishop Wilfred, who lived in the seventh century, was a great builder and restorer of churches, and Richard, Prior of Hexham, who lived in the twelfth century, describes from his own observation the church which Wilfred built at Hexham. According to this minute description, it was a noble fabric, with deep foundations, with crypts and oratories, of great height, divided into three several stories or tiers, and supported by polished columns, the capitals of the columns were decorated with figures carved in stone; the body of the church was compassed about with pentices and porticoes. Such a church we should now call Norman. Within the limits of a work like ours it is impossible to discuss such matters of controversy. We here only enter a protest against the belief that all churches now existing with some of the characteristics of the church of Wilfred, must be of the period after the Conquest. The passage is from Journey to the Western Islands of Scotland by Samuel Johnson (1709 – 1784), and actually relates to the island of Inch Kenneth. “The ruins of Iona” are not the ruins of “Saint Columba’s cell,” of that monastery which the old national Saint of Scotland founded in the midst of wide waters, when he came from the shores of Ireland to conquer a rude and warlike people by the power of the Gospel of peace; to preach with his followers “such works of charity and piety as they could learn from the prophetical, evangelical, and apostolical writings;” and, in addition to this first sacred duty, to be the depositaries of learning and the diffusers of knowledge. The walls amidst whose shelter Columba lived, training his followers by long years of discipline to the fit discharge of their noble office, have been swept away; the later erections are crumbling into nothingness (Figs. 198, 199); the burial-place of the Scottish kings is overgrown with rank weeds, and their tombs lie broken and defaced amidst fragments of monumental stones of the less illustrious dead. Silent and deserted is this “guardian of their bones.” The miserable hovels of a few fishermen contain the scanty population of an island which was once trodden by crowds of the noble and the learned. Here the highest in rank once came to bow before the greater eminence of exalted piety and rare knowledge. 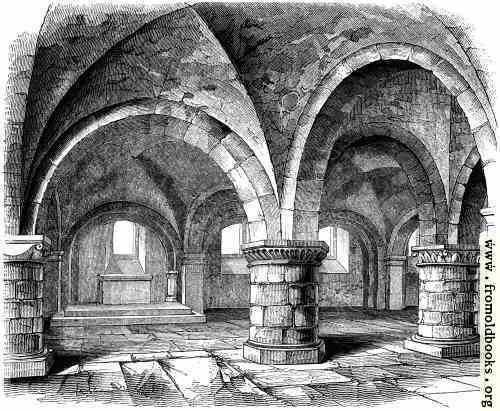 To be an inmate of the celebrated monastery of Iona was to gain a reputation through the civilized world. This was not the residence of lazy monks, as we are too much accustomed to call all monks, but of men distinguished for the purity and simplicity of their lives, and by the energy and disinterestedness of their labours. Iona sent forth her missionaries into every land from which ignorance and idolatry were to be banished by the workings of Christian love. When the bark that contained a little band of these self-devoting men went forth upon the stormy seas that beat around these western isles, to seek in distant lands the dark seats where Druidism still lingered, or the fiercer worship of Odin lifted its hoarse voice of war and desolation, then the solemn prayer went up from the sacred choir for the heavenly guidance of “those who travel by land or sea.” When the body of some great chief was embarked at Corpach, on the mainland, and the waters were dotted with the boats that crowded round the funeral bark, then the chants of the monks were heard far over the sea, like the welcome to some hospitable shore, breathing hope and holy trust. Such are the materials for the “local emotion” which is called forth by “the ruins of Iona;” and such emotion, though the actual monuments that are associated with it like these are shapeless fragments, is to be cherished in many a spot of similar sanctity, where, casting aside all minor differences of opinion, we know that the light of truth once shone there amidst surrounding darkness, and that “one bright particular star” there beamed before the dawning. Whilst we are disputing in what way the people shall be taught, ignorance is laying aside its ordinary garb of cowardice and servility, and is putting on its natural properties of insolence and ferocity. Let us set our hand to the work which is appointed for us, before it be too late to work to a good end, if to do this work at all. 210.—Edward the Confessor’s Chapel, Westminster Abbey,—now used as the Pix office. “Prompt transformation works the novel lore. The altars and images which the priest of Northumbria overthrew have left no monuments in the land. They were not built, like the Druidical temples, under the impulses of a great system of faith which, dark as it was, had its foundations in spiritual aspirations. The pagan worship which the Saxons brought to this land was chiefly cultivated under its sensual aspects. The Valhalla, or heaven of the brave, was a heaven of fighting and feasting, of full meals of boar’s flesh, and large draughts of mead. Such a future called not for solemn temples, and altars where the lowly and the weak might kneel in the belief that there was a heaven for them, as well as for the mighty in battle. The idols frowned, and the people trembled. But this worship has marked us, even to this hour, with the stamp of its authority. Our Sunday is still the Saxon Sun’s-day; our Monday the Moon’s-day; our Tuesday Tuisco’s-day; our Wednesday Woden’s-day; our Thursday Thor’s-day; our Friday Friga’s-day; our Saturday Seater’s-day. This is one of the many examples of the incidental circumstances of institutions surviving the institutions themselves—an example of itself sufficient to show the folly of legislating against established customs and modes of thought. The French republicans, with every aid from popular intoxication, could not establish their calendar for a dozen years. The Pagan Saxons have fixed their names of the week-days upon Christian England for twelve centuries, and probably for as long as England shall be a country. Wilfred found the church of York in a ruinous state, on taking possession of the see. He roofed it with lead; he put glass in the place of the ancient lattice-work. Time has brought to light some relics of this church at York, buried beneath the nobler Cathedral of a later age. It is probable that the more ancient churches were as much removed and changed by the spirit of ecclesiastical improvement as by the course of civil strife. One generation repaired, amended, swept away, the work of previous generations. We have seen this process in our own times, when marble columns have been covered with plaster, and the decorated window with its gorgeous tracery replaced by a villainous casement. The Norman church builders did not so improve upon the Saxon; but it is still to be regretted that even their improvements, and those of the builders who again remodelled the Norman work, have left us so little that we can rely upon for a very high antiquity. It would be something to look upon the church at Ripon which Wilfred built of polished stone, and adorned with various columns and porticoes; or upon that at Hexham, which was proclaimed to have no equal on this side the Alps. It would be something to find some fragment of the paintings which Benedict Biscop brought from Rome to adorn his churches at Wearmouth and at Yarrow; but they perished with his library under the ravaging Danes. More than all, we should desire to look upon some fragment of that church which the good and learned Aldhelm built at Malmesbury, and whose consecration he has himself celebrated in Latin verses of considerable spirit. He was a poet too, in his vernacular tongue; and he applied his poetry and his knowledge of music to higher objects than his own gratification. The great Alfred himself entered into his note-book the following anecdote of the enlightened Abbot, which William of Malmesbury relates: “Aldhelm had observed with pain that the peasantry were become negligent in their religious duties, and that no sooner was the church service ended than they all hastened to their homes and labours, and could with difficulty be persuaded to attend to the exhortations of the preacher. He watched the occasion, and stationed himself in the character of a minstrel on the bridge over which the people had to pass, and soon collected a crowd of hearers by the beauty of his verse. When he found that he had gained possession of their’ attention, he gradually introduced, among the popular poetry which he was reciting to them, words of a more serious nature, till at length he succeeded in impressing upon their minds a truer feeling of religious devotion.” (Wright’s ‘Biographia Britannica Literaria.’) Honoured be the memory of the good Abbot of Malmesbury. 227.—Saxon Emblems of the Month of January. 229.—Residence of a Saxon Nobleman. 238.—Ploughing, Sowing, Mowing, Gleaning, Measuring Corn, and Harvest-Supper. 239.—Convivial Party. Harleian MS. No. 603. 240.—Chairs. From Harleian MS. No. 603. But Athelstan left the memory of something better than victories. He was a lawgiver; and there are traces in his additions to the Code of Alfred of a public provision for the destitute amongst his subjects. The traditions of Malmesbury have, we doubt not, a solid foundation. He was a scholar, and collected a library for his private use. Some of these books were preserved at Bath up to the period of the Reformation; two of these precious manuscripts are in the Cotton Collection in the British Museum. The Gospels upon which the Saxon Kings are held to have taken the Coronation oath is one of them (See Fac-simile of the 1st Chapter of Saint John, Fig. 226). It is not only at Malmesbury that the memory of Athelstan is to be venerated. “As to the masonry, there is a peculiar sort of quoining, which is used without plaster as well as with, consisting of a long stone set at the corner, and a short one lying on it, and bonding one way or both into the wall; when plaster is used, these quoins are raised to allow for the thickness of the plaster. Another peculiarity is the use occasionally of very large and heavy blocks of stone in particular parts of the work, while the rest is mostly of small stones; the use of what is called Roman bricks; and occasionally of an arch with straight sides to the upper part, instead of curves. The want of buttresses may be here noticed as being general in these edifices, an occasional use of portions with mouldings, much like Roman, and the use in windows of a sort of rude balustre. The occassional use of a rude round staircase, west of the tower, for the purpose of access to the upper floors; and at times the use of rude carvings, much more rude than the generality of Norman work, and carvings which are clear imitations of Roman work. . .
“From what I have seen, I am inclined to believe that there are many more churches which contain remains of this character, but they are very difficult to be certain about, and also likely to be confounded with common quoins, and common dressings, in counties where stone is not abundant, but where flint, rag, and rough rubble plastered over, form the great extent of walling. Mr. Rickman then gives a list of “twenty edifices in thirteen counties, and extending from Whittingham, in Northumberland, north, to Sompting; on the coast of Sussex, south; and from Barton on the Humber, on the coast of Lincolnshire, east, to North Burcombe, on the west.” He justly observes, “This number of churches extending over so large a space of country, and bearing a clear relation of style to each other, forms a class much too important and extensive to be referred to any anomaly or accidental deviation.” Since Mr. Rickman’s list was published many other churches have been considered to have the same “clear relation of style.” We shall therefore notice a few only of the more interesting. The church of Earl’s Barton, in Northamptonshire, is a work of several periods of our Gothic architecture; but the tower is now universally admitted to be of Saxon construction (Fig. 209). It exhibits many of the peculiarities recognised as the characteristics of this architecture. 1st, We have the “long stone set at the corner, and a short one lying on it”—the long and short work, as it is commonly called (Fig. 201). 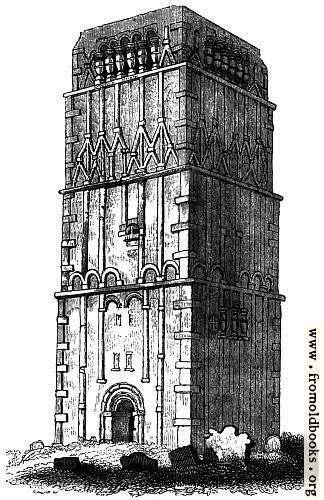 These early churches and towers sometimes exhibit, in later portions, the more regular quoined work in remarkable contrast (Fig. 200). 2nd, The tower of Earl’s Barton presents the “sort of rude balustre, such as might be supposed to be copied by a very rough workman by remembrance of a Roman balustre” (Fig. 202). 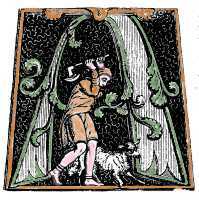 3rd, It shows the form of the triangular arch, which, as well as the balustre, are to be seen in Anglo-Saxon manuscripts. 4th, It exhibits, “projecting a few inches from the surface of the wall, and running up vertically, narrow ribs, or square-edged strips of stone, bearing, from their position, a rude similarity to pilasters.” (Bloxam’s ’Gothic Ecclesiastical Architecture.’) The writer of the valuable manual we have quoted adds, “The towers of the churches of Earl’s Barton and Barnack, Northamptonshire, and of one of the churches of Barton-upon-Humber, Lincolnshire, are so covered with these narrow projecting strips of stonework, that the surface of the wall appears divided into rudely formed panels.” 5th, The west doorway of this tower of Earl’s Barton, as well as the doorway of Barnack, exhibit something like “a rude imitation of Roman mouldings in the impost and architrave.” The larger openings, such as doorways, of these early churches generally present the semicircular arch; but the smaller, such as windows, often exhibit the triangular arch (Figs. 203, 205). 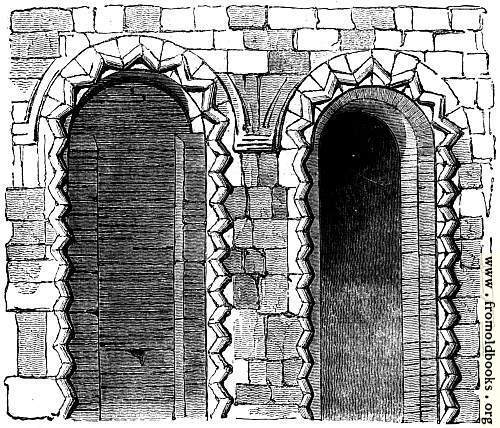 The semicircular arch is, however, found in the windows of some churches as well as the straight-lined, as at Sompting, in Sussex (Fig. 206). In this church the doorway has a column with a rude capital, “having much of a Roman character” (Fig. 204). A doorway remaining of the old palace at Westminster exhibits the triangular arch (Fig. 212). The windows of the same building present the circular arch, with the single zigzag moulding (Fig. 211). Mr. Hickman has mentioned the plain arch which is sometimes found between the chancel and nave, which he supposes to be Saxon. In some churches arches of the same character divide the nave from the aisles. 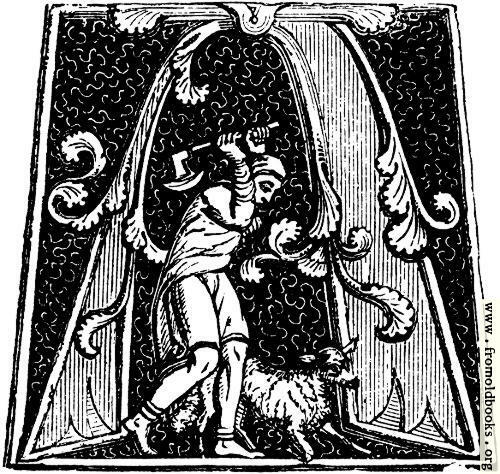 Such is the case in the ancient church of St. Michael’s, St. Alban’s, of the interior of which we give an engraving (Fig. 196). The date of this church is now confidently held to be the tenth century, receiving the authority of Matthew Paris, who states that it was erected by the abbot of St. Alban’s in 948. But the narrative of the circumstances attending the original foundation of this church, as related by Mr. Sharon Turner from the ‘History of the Monk of Ramsey,’ are singularly instructive as to the impulses which led the great and the humble equally to contribute to the establishment of monastic institutions. They were told that the piety of the men who had renounced the world brought blessings on the country; they were urged to found such institutions, and to labour in their erection. Thus was the Ealdorman, who founded the church of Ramsey, instructed by Bishop Oswald; and to the spiritual exhortation the powerful man was not indifferent. The illuminated manuscripts of the Anglo-Saxon period (and there are many not inferior in value and interest to the Pontifical which we have recently pointed out) furnish the most authentic materials for a knowledge of the antiquities of our early Church. It is a subject of which we cannot here attempt to give any connected view. Our notices must be essentially fragmentary. As works of art we shall have more fully to describe some of the Illuminations which are found in our public and private libraries. In connexion with our church history, it is scarcely necessary for us to do more than point attention to the spirited representation of St. Augustine (Fig. 217); to the same founder of Christianity amongst the Anglo-Saxons (Fig. 222); to the portrait of St. Dunstan (Fig. 218); and the kneeling figure of the same energetic enthusiast (Fig. 224). The group representing St. Cuthbert and King Egfrid (Fig. 219) belongs to the Norman period of art.